On August 9, 1851, A brief announcement appeared in the newspapers of the state capitol at Milledgeville, GA. Morgan G. Swain, prominent and colorful citizen of Troupville, GA, was dead. 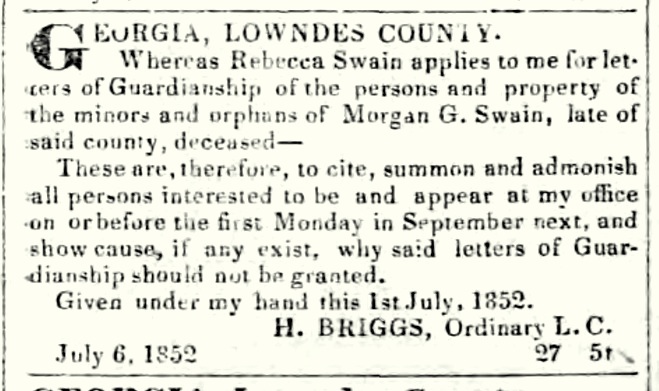 Obituary of Morgan G. Swain appeared Aug 19, 1851 in the Milledgeville Federal Union newspaper. DIED. – In Lowndes County, on the 9th inst., after a short but severe illness, Morgan G. Swain in 48th year of his age. A slightly longer obituary appeared a few days later in The Albany Patriot. Obituary of Morgan G. Swain. Departed this life on the 9th instant at his residence, in Lowndes county, Geo., MORGAN G. SWAIN, aged fifty years, after an illness of nine days. He has left a wife and a large family of Children, besides an extensive circle of acquaintances to lament his loss. Born in 1805 in Montgomery County, Georgia, Morgan G. Swain was one of thirteen children of Rebecca Johnston and Canneth Swain (1770-1831). His father, Canneth Swain, was a planter of Montgomery County and served there as Justice of the Peace from 1808 to 1812. Swainsboro, GA was named after his uncle, Senator Stephen Swain, who served in the Georgia Assembly for more than twenty years and who introduced the bill that created Emanuel County. About 1826, Morgan G. Swain moved with his parents to the newly created Thomas County, GA where his father had purchased land in 1825. In addition to the property in Thomas County, Canneth Swain owned nearly two thousand acres of land in Early and Lee counties, and herds of hogs and cattle. On September 3, 1828 Morgan Swain married seventeen-year-old Elizabeth Wooten in Thomas County, GA. She was a daughter of Redden Wooten and Susannah Byrd. Swain’s brother-in-law was Lasa Adams, who fought in the Indian Wars of 1836. On the census records of 1830, Morgan Swain was enumerated in Thomas County next to his father-in-law, Redden Wooten. For several years the Swains made their home in Thomas County; Morgan Swain served as 1st Lieutenant of the Militia in the 763rd District. But when Troupville was establish in 1838 as the county seat of Lowndes County, the Swains moved there to be among the town’s first residents. In Troupville, Morgan Swain set up a blacksmith shop and also took work as Deputy Sheriff, both trades that suited him as one of the biggest, strongest men in Wiregrass Georgia. For five years the Swains prospered in Troupville. While Elizabeth Swain raised their children, Morgan Swain “became owner and operator of Swain’s Hotel in Troupville, which competed with “Uncle Billie” Smith’s hotel [Tranquil Hall] for public patronage, especially during court and muster days.” But on June 20, 1843 Elizabeth Wooten Swain died at age 32, leaving Morgan with two young children to raise. Elizabeth Wooten Swain was buried, it is said, in Bethel Primitive Baptist Church cemetery, where others of the Wooten family connection are interred. About six months later, in January, 1844 Morgan Swain married a second time. On January 11, 1844, Swain married Rebecca Griffin, eldest daughter of Shadrach Griffin. Her father was a pioneer settler of Irwin County, and a road commissioner on that section of the Coffee Road which crossed over the Alapaha River. Morgan and Rebecca were married in a ceremony performed by X. Graham. 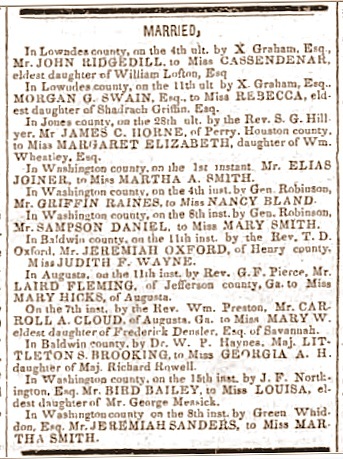 The wedding was announced in The Macon Telegraph. Wedding announcement for Morgan G. Swain and Rebecca Griffin appeared in The Macon Telegraph, Feb 20, 1844. Morgan G. Swain operated one of the three hotels in Troupville. One was “Tranquil Hall” run by William “Uncle Billy” Smith. The second was that operated by Jonathan Knight for eight or ten years until he moved away to Appling County about 1849. A third hotel, situated on the town square, was operated by Swain. Upon the occasion of his marriage in January, 1844 Swain apparently felt it necessary to advertise his intention to continue as innkeeper. “Swain’s Hotel,” the tavern operated by Morgan G. Swain, was properly called The Jackson Hotel, and for several months in 1844 he ran this ad in the papers of the state capitol. Jackson Hotel, Troupville, GA was operated by Morgan G. Swain. The subscriber respectfully informs his friends, and the public generally, that he still continues at his old stand, and feels grateful for the liberal encouragement heretofore extended to him, and assures his friends that no effort on his part, shall be wanting, to render the utmost satisfaction to those who may favor him with a call. His Table will at all times, exhibit the best specimens of eating, the country affords. His Stables are large and commodious – he is likewise able to oversee in person, that every care and the best of provender, is amply supplied to all animals, entrusted to him. His terms are adapted to suit the times – very reasonable. ‘Old Troupville! What a charming spot for the mind of the lover of reminiscent lore to contemplate! Here, semi-annually the Judge and his satellites, the jurors, litigants, court attaches, sightseers, horse-swappers, peddlers, tinklers, bummers, rowdies and all the rabble rant; all did congregate in august assemblage and solemn conclave. Despite this zest for life, in late 1845, Morgan Swain sought to dispose of his hotel and Troupville city lots. 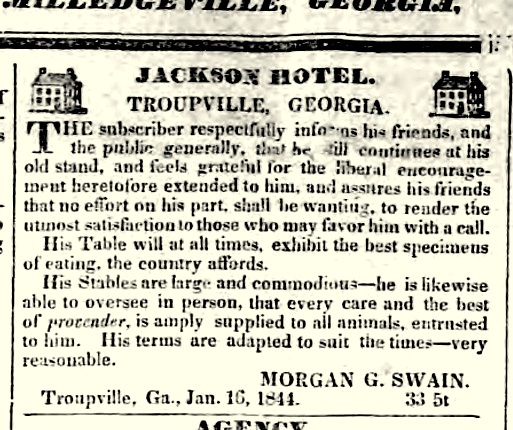 In November 1845, Morgan G. Swain advertised to sell the Jackson Hotel and his Troupville, GA property. 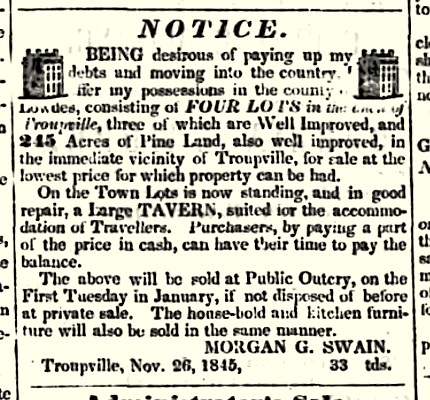 Being desirous of paying up my debts and moving into the country, I offer my possessions in the county of Lowndes, consisting of FOUR LOTS in the town of Troupville, three of which are Well Improved, and 245 Acres of Pine Land, also well improved, in the immediate vicinity of Troupville, for sale at the lowest price for which property can be had. On the Town Lots now is standing, and in good repair, a Large TAVERN, suited for the accommodation of Travellers. Purchasers, by paying a part of the price in cash, can have their time to pay the balance. The above will be sold at Public Outcry, on the First Tuesday in January, if disposed of before at private sale. The house-hold and kitchen furniture will also be sold in the same manner. During this period Swain had continued to hold public office, serving as Justice of the Peace of 658th District of Lowndes County from 1844 to 1849, and also as the county Jailor. In 1847 Swain’s old place, the Jackson Hotel, hosted the Lowndes County Democratic party for the purpose of selecting representatives to the gubernatorial convention and also candidates for election to the state legislature. 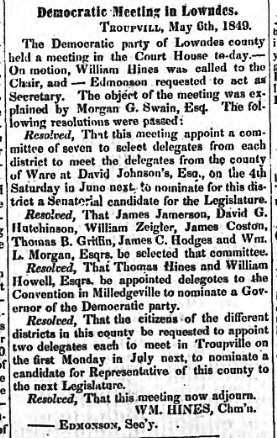 In 1849, Swain’s further interest in politics was apparent in his involvement in the activities of the Democratic party in Lowndes county. Morgan G. Swain was a member of the Democratic Party. Resolved, That this meeting appoint a committee of seven to select delegates from each district to meet the delegates from the county of Ware at David Johnson’s, Esq., on the 4th Saturday in June next, to nominate for this district a Senatorial candidate for the Legislature. Resolved, That James Jamerson, David G. Hutchinson, William Zeigler, James Coston, Thomas B. Griffin, James C. Hodges, and Wm. L. Morgan, Esqrs. be selected delegates to the Convention in Milledgeville to nominate a Governor of the Democratic party. Resolved, That the citizens of the different districts in this county be requested to appoint two delegates each to meet in Troupville on the first Monday in July next, to nominate a candidate for Representative of this county to the next Legislature. Resolved, That this meeting now adjourn. As given above, Morgan G. Swain lived a short but prominent life in old Troupville, GA and there he died on August 9, 1851. It is said he was buried in the cemetery of Bethel Primitive Baptist Church, Brooks County, Ga.
His father-in-law, Shadrach Griffin, served as administrator of his estate. 1822 Legal advertisement for administration of the estate of Morgan G. Swain, appeared in The Albany Patriot, August 22, 1851. Whereas, Shadrick Griffin applies to me for Letters of Administration on the estate of Morgan G. Swain, late of said county dec’d. These are therefore to cite, summons and admonish all persons interested, to be and appear at my office within the time prescribed by law, to shew cause (if any) why said letters may not be granted. Given under my hand at office, this, 16th day of August, 1851. Swain’s widow applied in July 1852, for guardianship of the “minors and orphans” of the deceased. 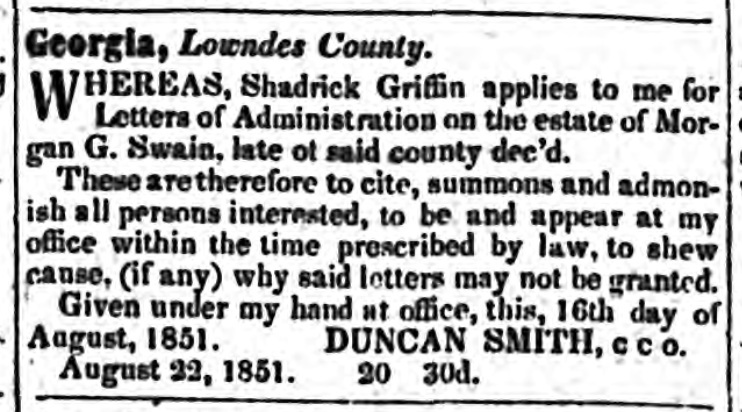 Dr. Henry Briggs, Ordinary of the Lowndes Court advertised the application in The Milledgeville Southern Recorder. Dr. Briggs was one of the first doctors to take up residence in Troupville, GA. These are, therefore, to cite, summon and admonish all persons interested to be and appear at my office on or before the first Monday in September next, and show cause, if any exist, why said letters of Guardianship should not be granted. Given under my hand this 1st July, 1852. H. BRIGGS, Ordinary L. C.
Shadrach Griffin, Swain’s father-in-law and administrator of his estate, continued with the disposal of his property and the conclusion of his affairs. 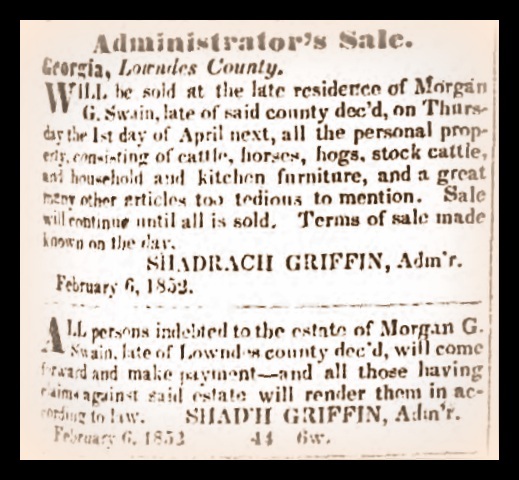 Will be sold at the late residence of Morgan G. Swain, late of said county dec’d, on Thursday the 1st day of April next, all the personal property, consisting of cattle, horses, hogs, stock cattle, and household and kitchen furniture, and a great many other articles too tedious to mention. Sale will continue until all is sold. Terms of sale made known on the day. All persons indebted to the estate of Morgan G. Swain, late of Lowndes county dec’d, will come forward and make payment – and all those having claims against said estate will render them in according to law. Buses Get all Passengers.—Because it claims the buses operating out of Valdosta, Ray City and Douglas are absorbing all the passenger business, the Georgia & Florida Railroad has petitioned the Georgia Railroad Commission to reduce its passenger service in and out of Valdosta and between Augusta and Tennille. The petition says that passenger trains 6 and 7 between Hazlehurst and Valdosta earned in January 31 and 32 cents respectively per train mile. A bus line, the petition says, operates from Swainsboro to Augusta, by way of Louisville and Wrens, and runs on a schedule just ahead of the passenger train schedule. Of late the bus has absorbed completely the passenger travel between Wrens and Augusta, and left practically none at the other points. 1922 Bus provides public transportation for Pennsylvania bus line. 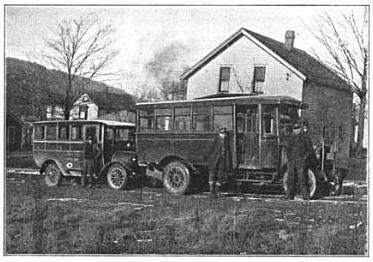 Image above: From the preceding page of the same issue of Bus Transportation, a photo of a 1922 era bus. The busses had to be rugged to take the ride on the rough early dirt roads of the day. There were no paved roads serving Ray City until the 1940s. By the late 1920s it was the Dixie Bus Line that was providing regularly scheduled passenger service to Ray City. Nashville Herald. Jan 24, 1929.
attville, Pinetta, Madison 7:40 a.m. 2:40 p.m. Connects at Valdosta for Lake City, Jacksonville, Tampa; at Madison for Greenville, Tallahassee, and Perry, for Ray City, Lakeland 5:15 p.m.
Leaves for Alapaha, Ocilla, Fitzgerald, 9:40 a.m., 6:40 p.m. Morning coach connects at Alapaha for Tifton, Albany, at Fizgerald for Cordele, Atlanta, Rochelle, Hawkinsville, Abbeville, Eastman, Dublin, Afternoon for Cordele, Atlanta. Leave for Alapaha, Enigma, Brookfield, Tifton, 1:00 connects at Tifton for Fitzgerald, Sylvester, Albany, Moultrie, Thomasville, Cordele, Macon. For further information call the Union Pharmacy, Bus Station.